This is a photo of the memorial in Hyde Park honoring the victims of the July 7th bombings in central London - a memorial I haven't yet actually seen, despite having visited Hyde Park several times since it was erected. 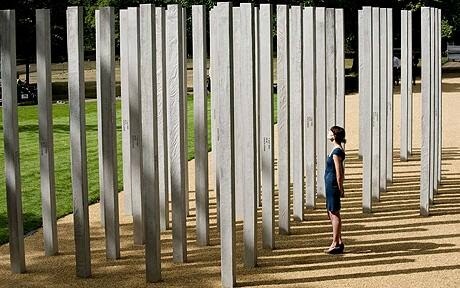 Reading the BBC's coverage of remembrance this morning has brought tears to my eyes - just as much as reading, watching, or hearing about the events of 9/11 has in the past. It's particularly difficult to read the survivors' stories; last week's Stylist had some insightful and heartbreaking entries from women who were affected in different ways - one a grief counsellor who worked with the doctors, nurses and emergency crews after the incident, another, a survivor who lost her legs but recently gave birth to a healthy baby girl. On that day, I was spending my summer at Mount Holyoke under a research fellowship, working on my thesis. John had just left the night before after a week-long stay with me in sticky hot Massachusetts, to return to London. I knew his flight arrived that morning, so I logged into my email account to see if I had any news from him. I didn't even know about the bombings until a friend IM-ed me and said, "Oh my God - did you hear about London?" I replied that I didn't know what she was talking about and quickly went to the BBC website, where I spent the next 10 minutes or so scanning the headlines with my hand over my mouth. Aside from the immediate shock, horror and disgust I felt, I remember panicking about John and his safety, as I knew he had to take the Piccadilly line straight into London from Heathrow and then a bus afterward - both which had been affected. I tried calling him in vain for the next 2 hours, not knowing that the mobile phone lines would be cut off for some time, as in the case in these situations. Hysteria. I finally received an email from him about four hours later, saying that he was safe at his uncle's flat in Pimlico, but very shaken and stunned. He only mentioned to me once about what he saw, but it was clear he had been traumatized by the experience. Sometimes when I take the tube into work, as I do every day without thinking, I become conscious of the fact that the risk is always there - as in any big city - for public transportation and other buildings to be targeted. One day, I saw a man get on my carriage with a backpack and I just suddenly had a bad feeling. It was paranoia, but I got off two stops early, just because that bad feeling wouldn't go away. I remember arriving to my first day of work in a new building at a previous job in London and being "trained" in "what to do" in case a terrorist attack occurred, as that particular building was "high risk" for such events. I don't walk around feeling nervous or scared, just as survivors and others of the British public who weren't directly affected that day stress: that they don't want to give in to the fear the terrorists hoped (and hope) to create. But on each anniversary of 9/11 or 7/7, I'm jarred back into the very bleak reality that these "things" can and do occur.